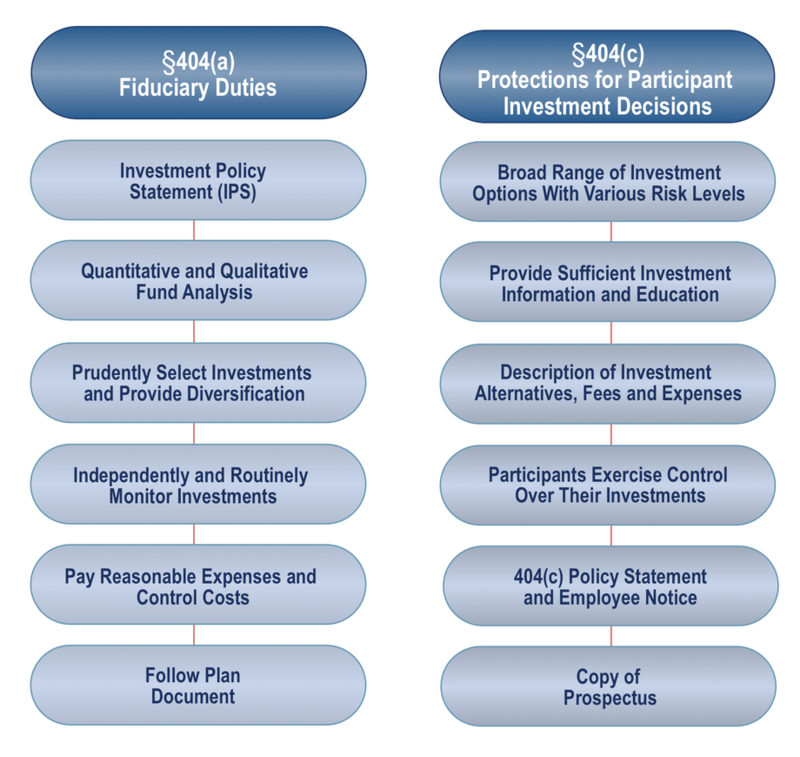 Responsibilities Under ERISA §404(a) and §404(c) : 401(k) & 403(b) Fiduciary Advisors, Inc. When was the last time you reviewed your basic fiduciary responsibilities? At your next Investment Committee meeting, consider a discussion around the basic guidelines as set forth by ERISA Section 404(a) and Section 404(c). If you do not have an Investment Committee that currently holds fiduciary responsibility for your retirement plan, please contact 401(k) & 403(b) Fiduciary Advisors for best practices in forming one. The core fiduciary responsibility under Section 404(a) is to maintain and follow a written plan document that complies with ERISA and when making decisions that affect the plan, ensure that these decisions are made prudently and “solely” on behalf of and for the exclusive benefit of the plan participants and their beneficiaries. Even when participants have full control of investment decisions, plan fiduciaries could still be responsible for participant investment choices. Fortunately, plan fiduciaries do have an option that offers certain protections. An effective method of managing this risk rests in Section 404(c) of the Employee Retirement Income Security Act of 1974, as amended (ERISA). This provision generally allows fiduciaries to be relieved of liability for participants' investment decisions. While not all-encompassing, the following acts as a primer in regards to ERISA §404(a) and §404(c). A final key element to §404(c) is to periodically notify participants of your intention to comply with this requirement. The most effective way to do so is through the periodic distribution of a §404(c) Notice and Policy Statement.